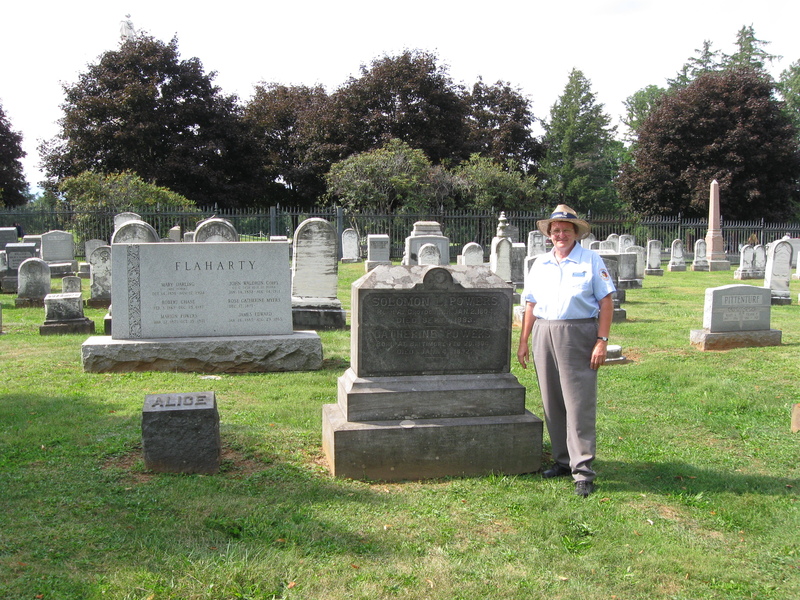 Gettysburg Licensed Battlefield Guide Deb Novotny is standing near the Solomon Powers’ family plot in Evergreen Cemetery. This view was taken facing northwest at approximately 3:30 PM on Sunday, September 6, 2009. Gettysburg Licensed Battlefield Guide Deb Novotny is a retired American History Teacher from Gettysburg High School. She has been a Licensed Battlefield Guide since 1975 and serves on the board of the Evergreen Cemetery Association. She is our host for our series on Evergreen Cemetery, Gettysburg’s civilian cemetery. In the first Evergreen Cemetery post, Deb showed us the headstones damaged during the battle. In our second post she introduced us to the cemetery, and showed us the statue of Elizabeth Thorn and the plot where some soldiers killed during the battle are buried. 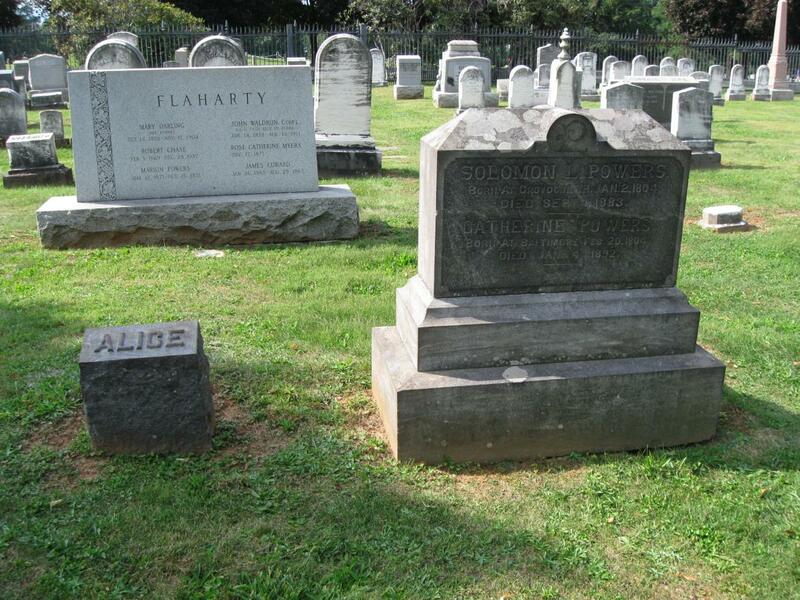 In our third post she shows us the grave of Virginia “Ginnie/Jennie/Jenny” Wade, Jack Skelly, James Gettys, and the Thorn boys. 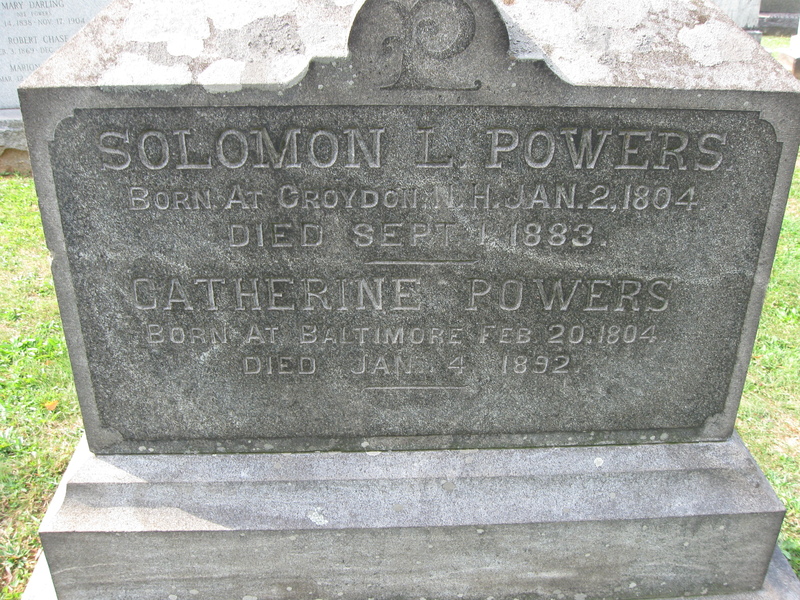 In today’s post, Gettysburg Licensed Battlefield Guide Deb Novotny shows us the graves of the family of Solomon Powers. This map shows the location of where our Evergreen Cemetery videos were produced. Videos #1- #14 were shown in our previous Evergreen Cemetery posts. Videos #15- #17 were taken at the family plot of Solomon Powers. This map was created facing north at approximately 6:30 PM on Wednesday, September 9, 2009. In Video #15 (Videos #1-#14 were shown in our previous Evergreen Cemetery posts) Gettysburg Licensed Battlefield Guide Deb Novotny is in Evergreen Cemetery at the plot for the Solomon Powers Family. 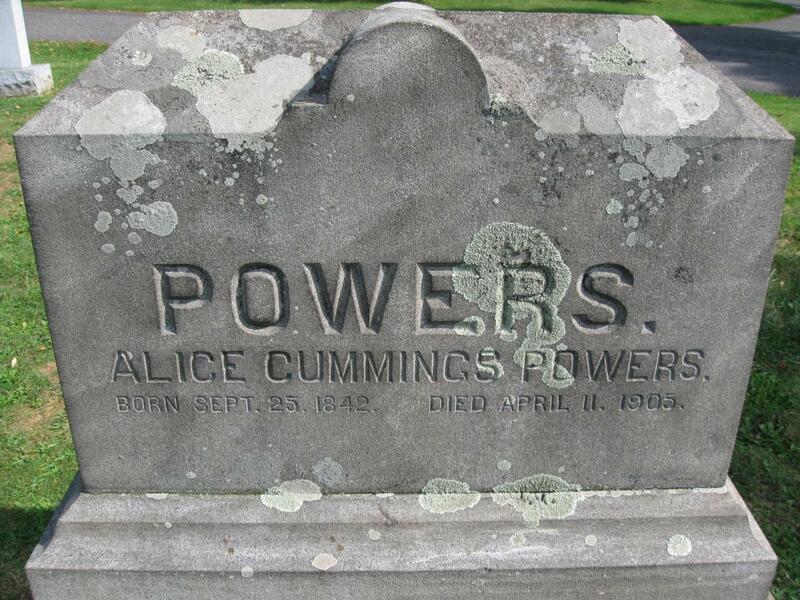 She describes some incidents relating to Solomon Powers’ daughters, Jane Powers and Alice Powers. This view was taken facing northwest at approximately 3:30 PM on Sunday, September 6, 2009. The 1860 federal population census shows that he was “white,” born circa 1803 in New Hampshire, a Granite Cutter, and that he lived in the same dwelling and was part of the same family with Catharine Powers (1804-) born in Maryland; Ann J. 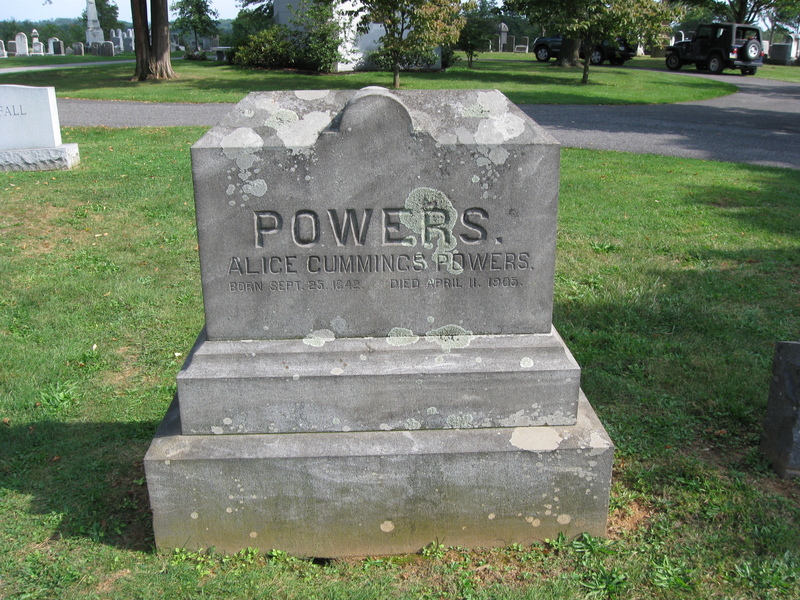 Powers (1836-), born in Maryland; Mary D. Powers (1837-), born in Pennsylvania; Elizabeth C. Powers (1839-), born in Pennsylvania; Alice Powers (1841-), born in Pennsylvania; Elizabeth L. Powers (1845-), born in Pennsylvania; Joshua Haphold (1841-), born in Maryland. His real estate had a value of $1500, and his personal estate had a value of $600. This view was taken facing northwest at approximately 3:30 PM on Sunday, September 6, 2009. A closer view of the primary monument in the Powers’ Family Plot. This view was taken facing northwest at approximately 3:30 PM on Sunday, September 6, 2009. 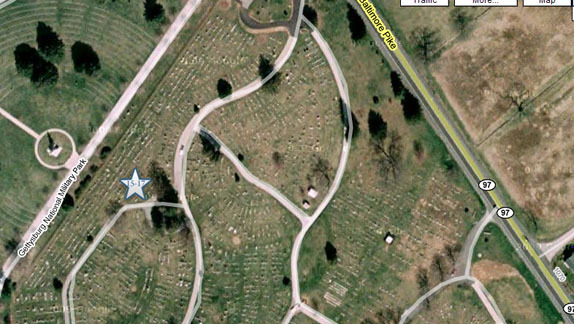 In Video #16 Licensed Battlefield Guide Deb Novotny is in Evergreen Cemetery at the plot for the Solomon Powers Family. She relates some facts about Powers’ Hill, which was also used as a location for a Union Signal Station during the Battle of Gettysburg. This view was taken facing northwest at approximately 3:30 PM on Sunday, September 6, 2009. The marker for Alice Powers is south of the main marker. This view was taken facing northwest at approximately 3:30 PM on Sunday, September 6, 2009. 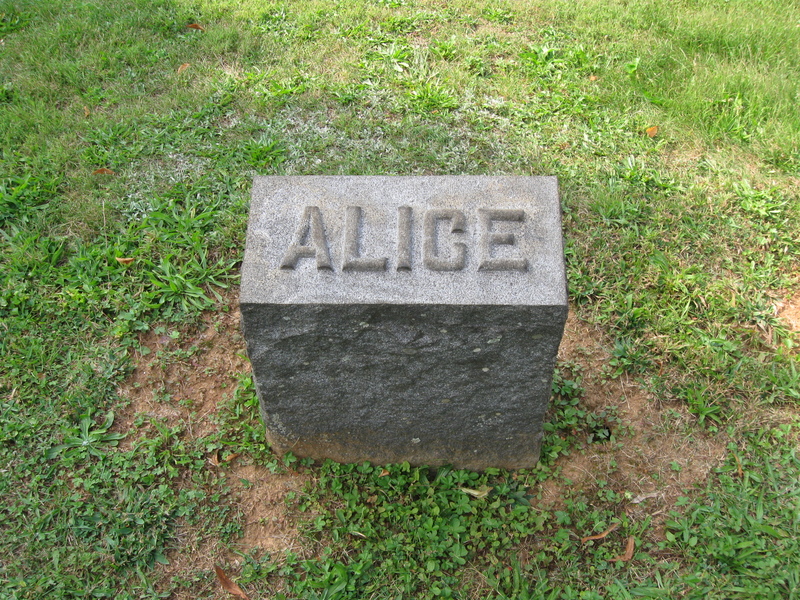 More information about Alice is on the back of the primary monument in the family plot. This view was taken facing southeast at approximately 3:30 PM on Sunday, September 6, 2009. A closer look at the back of the Powers’ monument. This view was taken facing southeast at approximately 3:30 PM on Sunday, September 6, 2009. In Video #17 Deb Novotny is in Evergreen Cemetery at the plot for the Solomon Powers Family. She describes an accident on November 20, 1863 that took the life of a 14 year old boy who lived at the home of Solomon Powers. This view was taken facing northwest at approximately 3:30 PM on Sunday, September 6, 2009.